When your inner circle of family and friends is a little larger (up to 30), our Small Wedding Package gives you everything you could hope for! Coastal Weddings & Events’ Small Wedding package allows you to celebrate your marriage on the Sunshine Coast with those most near and dear. Express your style and celebrate all the unique things that have brought you together with expert help designing and planning a custom ceremony and reception. On ‘the day,’ Melissa, Ben, Kori and staff were priceless! We were able to get ready and relax, not worrying about a thing at our venue! They did a beautiful job, and we were told by many people that our wedding was the best wedding they had ever been to! What's Included in the Small Wedding Package? More Than 30 Guests? No Worries! Contact Coastal Weddings & Events and we can help with all your details! We look forward to hearing from you: Call (604) 720-3698 or email us here. 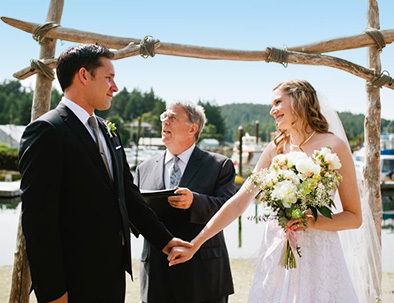 YOU choose your ceremony and reception locations – anywhere along the Sunshine Coast! The cost of your ceremony and reception venue will be included in your package rate. We can make suggestions for you based on your tastes, or, if you already have a ceremony and reception location in mind, we’ll take it from there! You can choose from any location on British Columbia’s gorgeous Sunshine Coast. YOU choose where you and your honey will stay – choose anywhere along the Sunshine Coast. The cost of your accommodations will NOT be included in your package rate. This is because each accommodation’s rate is different, and we want to keep the options open for couples of every taste! We can make suggestions for you based on your ideals, or, if you already have accommodations in mind, just tell us where you want to stay, and we’ll take it from there! All featured items are subject to availability. Click below to learn more about our additional package options, or get started today by calling us at (604) 720-3698 or contacting us here. We look forward to hearing from you!